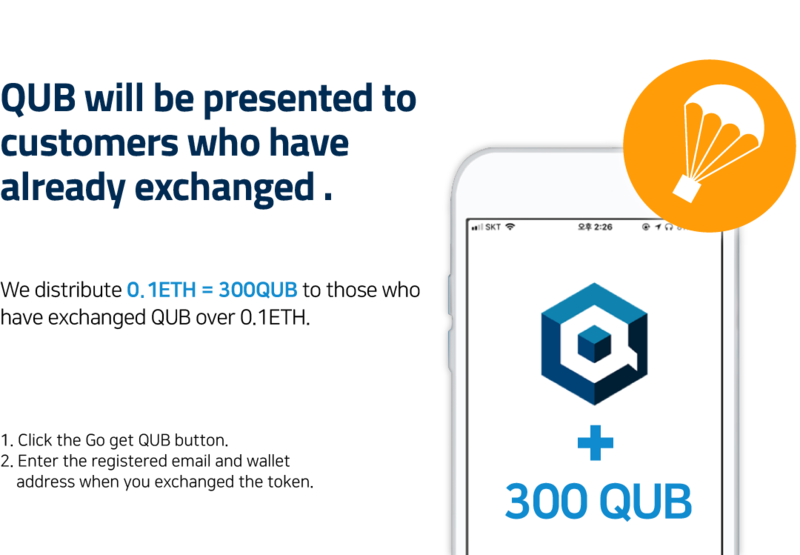 For customers who have trusted and waited for Cube Chain We will offer additional QUB reward event with gratitude! At the existing Cube Chain official homepage, we will give you an additional ETH: QUB = 0.1: 300 ratio. If you have exchanged QUB with Etherium for 0.1 ETH or more. Cube Chain will not be doing any special event again! * This event applies only to members who have signed up for the Cube Chain website, completed KYC certification, and registered their wallet address. 1. Access the event participation page in the Cube Chain AIRDROP site. 2. Please enter your e-mail address correctly on the official website. 3. Please enter the Ethereum Wallet address you used to buy the QUB correctly. If the E-mail address and the Ethereum Wallet address you enter are different from the information you used to buy QUB, there may be disadvantaged in participating in this event. QUB will be distributed sequentially after January 20, 2019. Copyright©Cube Chain. All Rights Reserved.